The Central Highlands province of Lam Dong is leading the country in high-tech agriculture. According to the Lam Dong Crop Production and Plan Protection Sub Department, the province grows crops on nearly 51,800ha using high-tech farming methods, including nearly 19,000ha for vegetables, over 3,623ha for flowers, about 6,335ha for tea, and nearly 19,885ha for coffee. The Lam Dong Agricultural Promotion Center has provided support for farmers to apply IoT in agricultural production. Thanks to IoT application, farmers are more comfortable on time and more accurate in the process. IoT devices connect to sensors to measure temperature, humidity and pH levels in order to operate the irrigation, cooling, light and diaphragm systems. The systems can also relay alert messages to users in case problems arise. IoT helps users fully understand their production status. The use of IoT in agricultural production allows the tracing of produce origin in order to both increase performance and meet market demands. Dang Xuan Truong, CEO and Founder of the Hachi Group, has realized the potential of applying information technology in the agricultural sector. He and his group have developed the Smart Hydroponic System app to boost harvests. The system consists of three parts: an app for mobile phones with Android or IOS operating systems; IoT hardware; and a normal hydroponic system. The mobile app can control environmental parameters in terms of humidity, temperature, and light, while the IoT hardware connects the hydroponic system with the mobile app and controls the pumps and sends data on the environment to the server. In addition to the initial hydroponic projects for households in Hanoi, the Hachi Group has signed contracts with large farms in provinces such as Bac Ninh, Hue and Lam Dong. 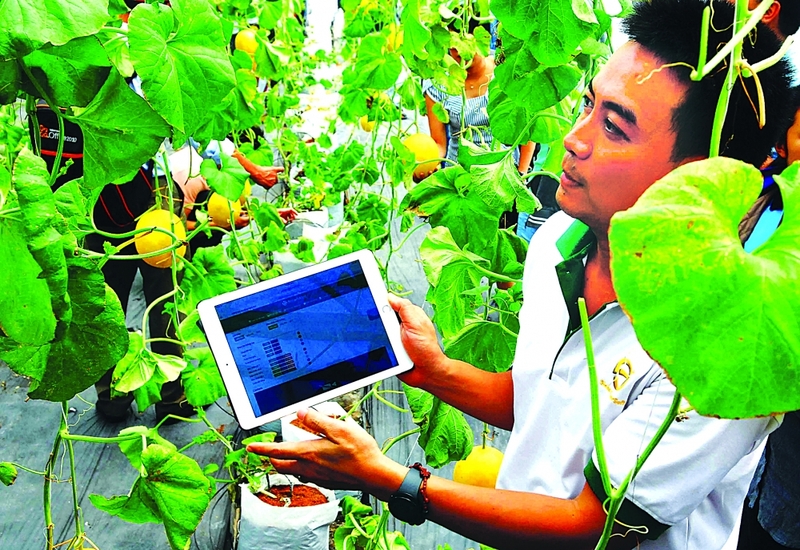 The Quang Trung Software City has developed the Smart Agri management system, which allows farmers to collect information about temperature, humidity, light and pH levels, and regulate devices to ensure a standard environment for the plants. monitor their entire production process using smartphones and tablets.